Your Special Christening offering Children’s Entertainment & Balloon Decoration in Stockton, and all over the North East. We are always pleased to be invited to christening celebrations, as a company that have attended many over the years. I always think about the great feedback we have been lucky enough to have received and enjoyed just being a part of such lovely and most of all important events for children and families in Stockton. As you will already know as a mam or dad, the most important part of your christening celebration are your friends and family. I always find it so lovely to meet the family and find the whole experience the best part of what I do professionally. Its great to meet people that in most cases have travelled far and wide, and from all parts of the north east. As a children’s entertainer I attend christenings in all parts of the North East and have the pleasure of working in many different venues. We are so lucky in Stockton to have such amazing facilities for Christening Celebrations and also great venues for children to visit. When offering our children’s entertainment for christenings in Stockton, Hartburn, Yarm, Whitewater, and all over the North East. We have always listened and valued our customers feedback, and make sure that we deliver the best entertainment for children at christenings and creating smiles is our guarantee to you. We realise that a christening is a very important day, and always strive to make the entertainment enjoyable and a memorable part of it. We understand that when a christening is ongoing, you as a parent will have many important things on your mind, with photos to think about and also friends and family to socialise with. With this understanding I will then greet your family as they arrive at the Christening Celebration, informing and exciting the children about the children’s entertainment that is about to happen. It is very important to me that our customers always feel that the process of booking a childrens entertainer for their Christening is not only hassle free, but is noticed as being a service that does not need to bother them in any way on the day. As the parent of the child that is getting christened, the last thing we want is for you to feel that you have any concerns about the entertainer at the event. Allow us to socialise with your family and the FUN will just happen. I really enjoy this opportunity because the rapport you bring as the first person they really see at the venue is really powerful and allows me to be viewed as part of the christening celebration rather than a stranger. This method has actually been commented about many times, as simple as it sounds because you are associated with the celebration rather than being separate from it. To see how people react when you surprise the children with the offer of exciting entertainment that in most cases they may not have expected is so rewarding and makes the job a pleasure to do. Remember that even though we do say ‘children’s’ entertainment, in fact this is not really the case. 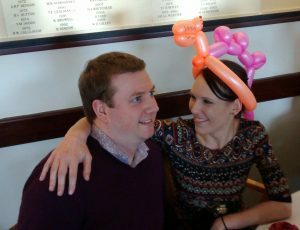 Why should a mother or father miss out on the chance of receiving a FUN balloon model, and we do walk-around balloon entertainment for many events where Adults are the main focus, so don’t be shy. Ask for your favourite animal or other creative idea that you would love to see being created with balloons and let’s all have some FUN that will not be forgotten at your christening celebration. Imagine how you will feel after the event thinking about how much your family and friends enjoyed the Balloon Walk-around Entertainer and the Laughs that you had looking at your Uncle and Auntie or Brother with a Crazy Mad FUN hat on. This is what we at ‘Your Special Christening’ can offer you with the amazing skills of Balloon-Al our resident children’s entertainer who will offer comedy and a balloon prize for your guests that will guarantee a SMILE that makes your memories great. The FUN children’s party packages we offer in Stockton for christenings have worked so well over the years and continue to be so popular at christening events all over the North East. Tel: 07903 308694 to discuss how we can be a part of you christening celebration and let’s make it a one that you never forget. Please feel free to ask any questions that concern you about your christening event. Our observations of what we have experienced in the past give us an understanding of how valuable it is to feel that your Christening will be a great success. Tags: Childrens Entertainer for Christenings in : Durham, Darlington, Newcastle, Gateshead, Sunderland, Hartlepool, Middlesbrough, Northumberland and all North East.